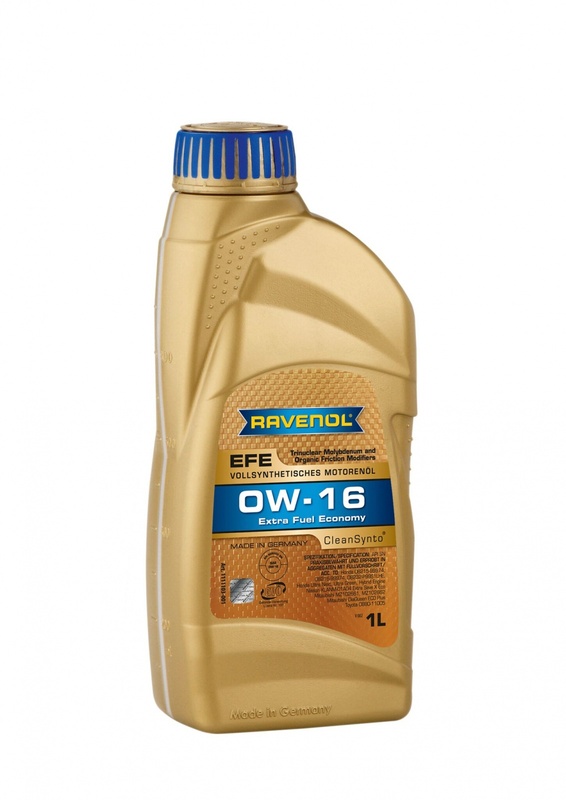 RAVENOL EFE SAE 0W-16 makes its contribution to protecting the environment by reducing emissions and is suitable for extended oil change intervals according to manufacturer’s specifications. Use if the engine manufacturer recommends using a low viscosity oil with the viscosity category 0W-16, 0W-20 or 5W-20 with API SN Licence. To see the benefits of using RAVENOL's fully licenced and approved 0W-16 instead of a non-licenced product offered by some of our competitors take a look at this infographic. API’s Engine Oil Licensing and Certification System (EOLCS) is a voluntary licensing and certification program that authorizes engine oil marketers that meet specified requirements to use the API Engine Oil Quality Marks. Launched in 1993, API’s Engine Oil Program is a cooperative effort between the oil and additive industries and vehicle and engine manufacturers Ford, General Motors, and Fiat Chrysler and those represented by the Japan Automobile Manufacturers Association and the Truck and Engine Manufacturers Association. The performance requirements and test methods are established by vehicle and engine manufacturers and technical societies and trade associations such as (ASTM), (SAE), and the American Chemistry Council (ACC). The Engine Oil Program is backed by monitoring and enforcement program that ensures licensees adhere to program requirements. This includes running physical, chemical, and performance tests on licensed engine oils and verifying that the API-registered Marks are properly displayed on containers and convey accurate information to consumers. API has been testing packaged and bulk engine oils under its Aftermarket Audit Program (AMAP) since 1994. AMAP replaced the Oil Labeling Assessment Program (OLAP), a testing program jointly funded by the U.S. Army, the Independent Lubricant Manufacturers Association (ILMA), the former American Automobile Manufacturers Association (AAMA), and API. Under AMAP, API-licensed engine oils are purchased in the marketplace and tested to determine their physical, chemical, and performance properties. The results are compared to licensee formulations on file at API. Conforming oils show test results that are consistent with the formulations on-file and meet program requirements. All samples undergo elemental analysis, viscosity at 100°C, and high-temperature/high-shear testing. They may also be tested for cold cranking, pumpability, volatility, gelation, foaming, filterability, flash point, and shear stability. Product packages are checked to make sure they correctly display the API Marks and carry product trace codes and bulk oil receipts are checked for compliance with NIST Handbook 130 requirements. Got a shock when it came out but all good and it works well. Only complaint, the spout took some pulling out. Though it mentions other Japanese cars I was recommended this for my Suzuki and so far it's working really well. No complaints. Thank you, it is suitable for Suzuki cars and we have now updated the information. Experienced noticeable improvement in fuel economy. Arrived quickly. Noticed improvement in fuel economy after oil change. Thanks for the feedback. The new EFE 0W-16 uses state of the art technology developed to reduce fuel consumption - great to hear that it works!